Get your students outdoors and inspire them. At CMRCA, climbing and high-ropes activities are a means, not an end. In our adventure-packed outdoor education elements, students are led through a diverse set of activities that challenge them to define what they are comfortable with, what causes them to grow, and what inhibits them from full participation. The skills that students learn during outdoor adventure activities give them the tools to reframe challenges they face during other parts of the trip, and even when they return home. Rock climbing provides students with an opportunity to climb to new heights. 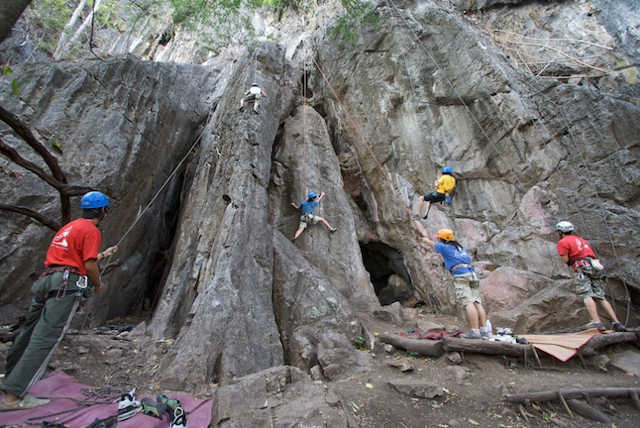 Our experienced instructors facilitate an incredible rock climbing learning experience where students will climb, belay and backup belay. Students develop trust among the group and cheer each other throughout the activity. High rope activities give participants a challenge and opportunity to face difficult decisions through abseiling / rappelling, tyrolean traverses and rope bridges. These wild rope elements give participants a new perspective of the area they visit and help them to achieve previously impossible tasks, allowing them to grow as they complete each new activity. Crawling, climbing and sleuthing their way through tunnels and rooms, participants see stunning stalactites, flow stones, and cave life. Using this stunning and delicate ancient environment, our caving program becomes an incredible experiential lesson on geology, cave formation and our earth’s history. CMRCA trekking and wilderness navigation sessions will open students to the world of outdoor living in an immersive 1-4 night experience. From packing a backpack to pace setting, route planning to lighting a camp stove, an independent journey in the wilderness requires a large portfolio of skills. CMRCA facilitates overnight experiences at several base camps throughout Northern Thailand. Depending on the exact location, the camps are fully remote and others have bucket showers and squat toilets as part of the accommodations. CMRCA routinely incorporates adventures hosted by partner organizations into custom-build programs.